Gunung Mulu National Park near Miri, Sarawak is the place to go if you want to see big caves and karst formations in the tropical rain forests of Borneo. It is about 53,000 hectares, gazetted as a national park in 1974 and was designated a World Heritage Site in 2000. The highest peak here is Gunung Mulu with a height of 2,377 m with sandstone pinnacle. This mountain is the second highest in Sarawak and the fifth in Malaysia. The tallest mountain in Sarawak is Gunung Murud. The park has over 295 km of explored limestone caves. These caves are the home to millions of bats and swiftlets bird and you will most probably spot them here. 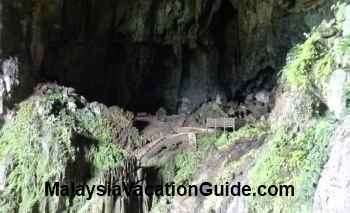 The Sarawak Chamber is the largest known cave chamber in the world with 600m X 415m X 80m in length, width and height. The world's longest cave passage at 51.5km is located at Clearwater Cave. Other caves are Lang Cave, Green Cave, Deer Cave, Racer Cave, Wind Cave, Lagang Cave, Black Rock Cave and Drunken Forest Cave. Other than that, there are rivers, canyons, flora and fauna that you will experience here. The diverse vegetation here is an excellent place for botanist to study. Study showed that there are over 3,500 species of plants out of which 2,000 are flowering plants. The trees located up to 800 m above sea level include the Dryobalanops and Shorea. From 800 m to 1,200 m, you will find myrtles and oaks. Mosses, lichens and pitcher plants can be found above 1,200 m.
Bird watchers can spot some of the over 260 species of birds recorded here. Snakes, amphibian, lizards, fishes, Sumatran Rhinoceros, orang utan , wild cattle, monkeys, tarsiers, slow loris, deer, bearded pig and honey bear can be found here. Insects include the leaf insects, beetles and cicadas to name a few. Over 200 species of bats have been found in the abundance of caves here. The bats in huge numbers come out of the caves in the evening from 5:30pm to 6:30pm. There are plenty of activities that you can do here. Explore the Caves. There are many caves that you can explore with different levels of difficulty. The common ones are Deer Cave, Lang Cave and Clearwater Cave.Deer Cave is reputed to be the largest underground river passage in the world and is often said to be big enough to park a jet plane. Up to 3 million bats stream from the caves in the evening. Do not miss this sight. The exodus from the caves could last for half an hour or so.These bats leave the caves to look for insects within the vicinity of the forest. You will not miss the smell of bats dropping known as guano at the cave floor. At the Deer Cave, look out for the 100 m mound of guano with cockroaches feeding on it. Jungle Trekking is another common activity you do. Try the night walks and discover some of the nocturnal animals. Canopy Walk at the 480m Mulu Canopy Skywalk and discover the life of the forest at over 20 m above the ground. Swim at the Paku Waterfall. The Pinnacles Trail is for those who are fit but the reward is the magnificent pinnacles that rises 1,200 m. It takes about 10 hours for a return trip to the pinnacles. The Gunung Mulu Trail is the trail to choose to scale Gunung Mulu. A 4-day trek is required with the help of a guide over a distance of 24 km. Get local guides and porters to go up the summit as the some parts of the trail are not properly marked. Always stay together as a group and do not venture away from the trail.The climb to Gunung Mulu will start with the initial goal to reach Camp 3 from the Base Camp. It takes about 10 hours of hiking and a distance of 12 km before reaching Camp 3.Camp 1 is located 5.6 km away from Base Camp and the walk is not too difficult, crossing small streams and rivers. Look out for gingers, fungi, insects and orchids along the way.Camp 2 is about 2 hours hike away followed by the more difficult terrain to Camp 3. You will reach Camp 3, an elevation of 1,270 m above sea level before nightfall. Another 12 km needed before reaching the summit. You will stay overnight at the shelters here that are equipped with basic needs such as toilets and kitchen.The next destination is Camp 4 which is about 6.7 km away. It is now cooler due to the higher altitude. You will depart in the morning and reach the camp by mid noon, about 6 hours hike. This is the place to take a breather and enjoy the panoramic view of the tropical rain forest. Look out for the many mountains and even Brunei from here as you spend a night here.Mount Mulu summit is now only 5.5 km away and you will depart in the morning. This is a more difficult climb as the trail to the top is steep hence ropes have been put in certain location to help hikers along the way. You will reach the summit in about 3 hours. Take photographs and enjoy the scenery from here before proceeding to descend the summit.You will camp one night at Camp 3 before going down to the Base Camp the following morning. 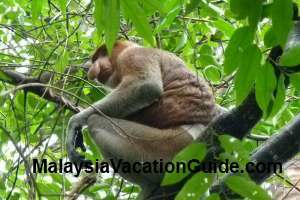 This could well be one of your most memorable experience at Gunung Mulu National Park. The Headhunters' Trail takes you through the heart of Mulu rainforest from Camp 5 to Kuala Terikan. Canoeing and mountain bikes can be hire from the resort. Entrance fee is RM10 per person. There are quite a number of good accommodation at the park headquarters. You can choose to stay at the hostel, bungalows, rooms, long houses or even camping. Price ranges from about RM20 to RM230. Camping per person is RM5. If you want a more comfortable stay, the Royal Mulu Resort provides 188 rooms fully air-conditioned with internet connection, spa, TV and other typical hotel facilities. Check and compare the price of this resort here. The best way to come to Gunung Mulu National Park is by taking a flight from Kota Kinabalu or Miri using MAS wings airline, a subsidiary of Malaysia Airlines that ply most internal routes in Sabah and Sarawak. Coming here by bus and boat takes more time but is a unique experience. 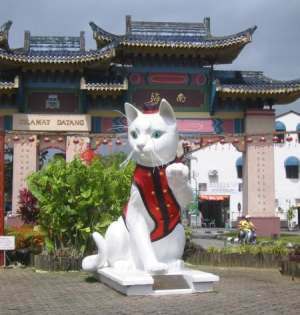 Head to Kuala Baram by bus from Miri followed by 3-hours express boat ride to Marudi. From Marudi, take another boat to Long Terawan and change to a smaller boat to Long Apoh if the water level is not high enough. Entire journey could take up to 10 hours. It is better to arrange the transportation with the tour agent. Contact the park for further enquiries.